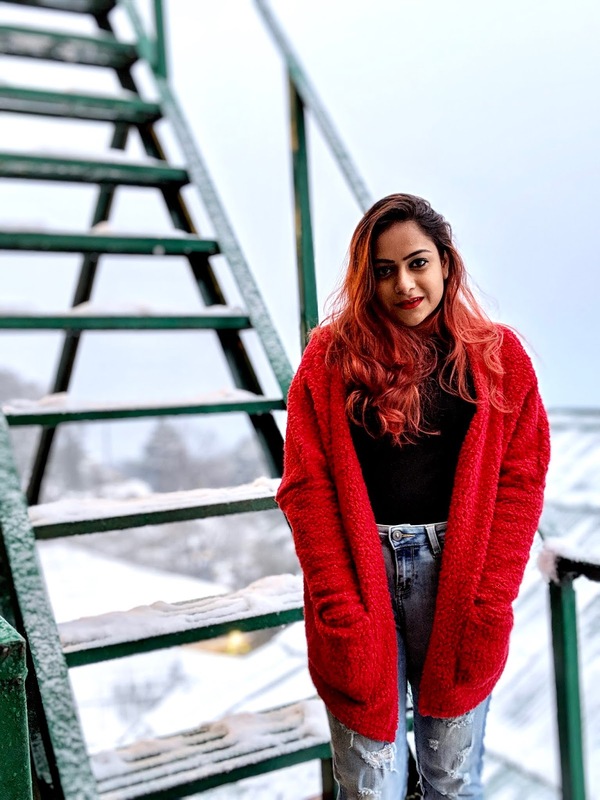 What better a way to start 2019 than travelling! 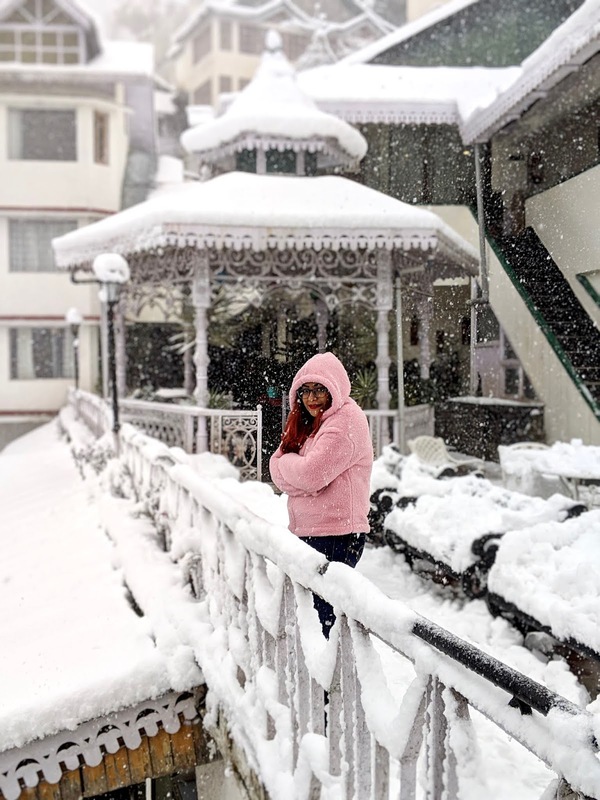 My first weekend getaway of this year was to Dalhousie. 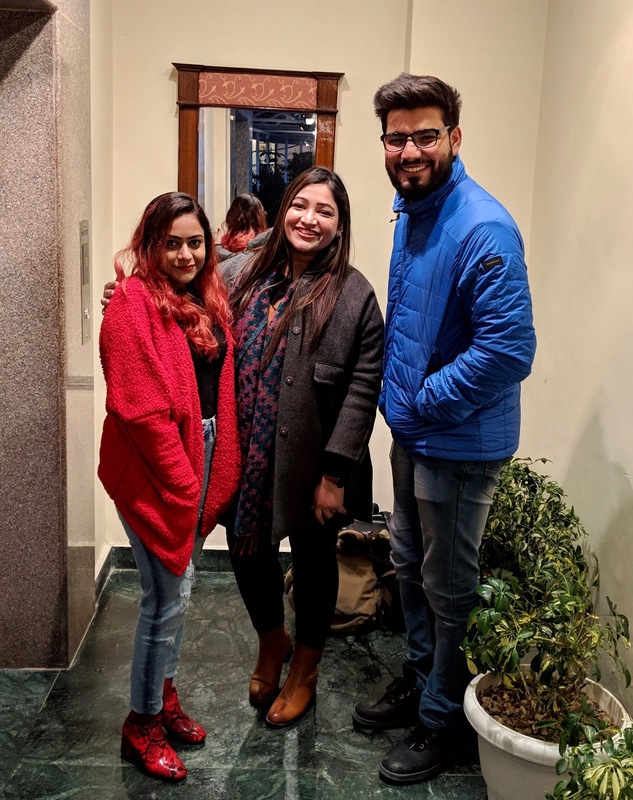 A lot of you know, I was in Lucknow for the New Year eve, but I had to be back in Delhi to join back by office, but somehow I wasn't feeling satisfied. I said to myself "This is not how I want to start my year", and that was it! 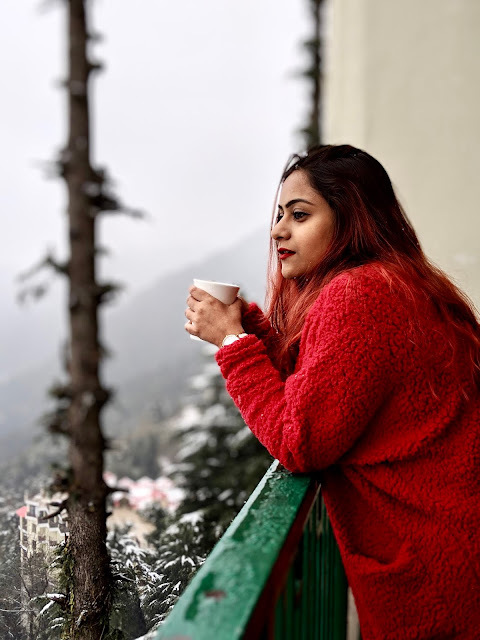 Two of my friends had planned this trip, and asked me if I wanted to join, and I reacted spontaneously and the next I found myself at home, packing anything and everything that I found on the top in my wardrobe and running for the bus, that we boarded from Delhi for Dalhousie. We had booked our Volvo through redBus (Indo Canadian Tpt. Co.). 3 seats costed us Rs.3685 and we boarded it from Majnu Ka Tila (North Delhi) at 9:30 PM (Friday, Jan 4). It was an overnight journey, and we had so much fun all night which included a little break that we took at Murthal for dinner, all the gossip, and some hilarious conversations. I had mostly slept since I could see nothing outside the window; it was so foggy that we'd given up peeking out! Early January it was after all. We were literally driving into "nowhere". At 7 in the morning (Jan 5), we reached Dalhousie and it was the BEST SIGHT I'd ever witnessed. I won't lie, it was my first snow experience. 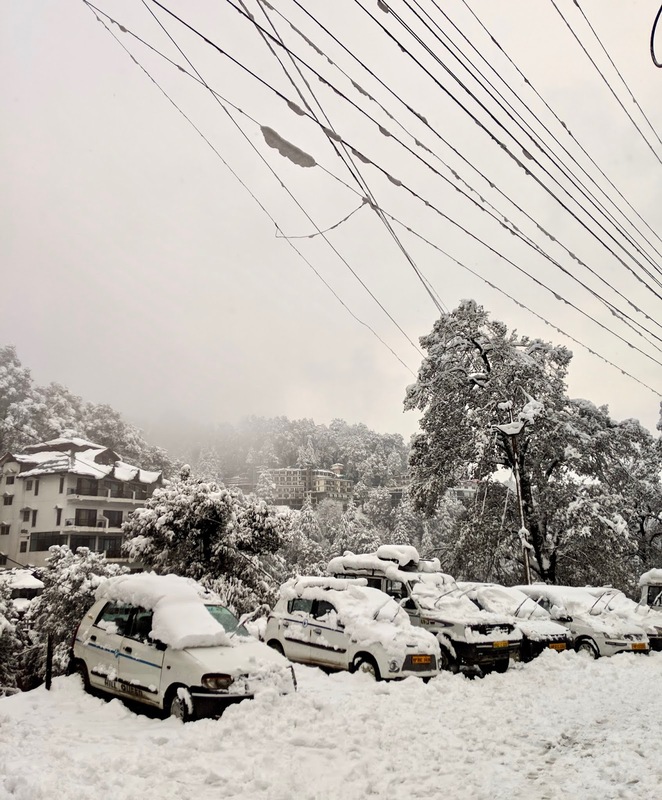 It seemed like the little white balls are welcoming us, as we were reaching the bus station in Dalhousie. 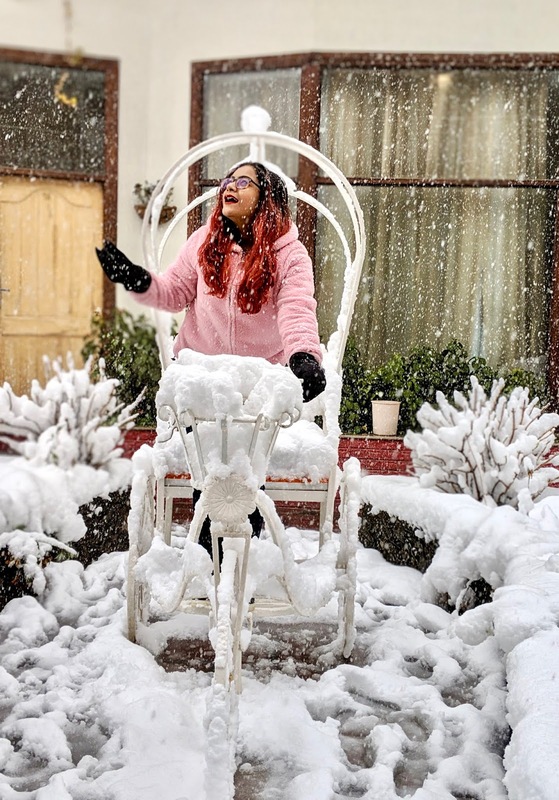 The locals said, it had started snowing right then, and we were lucky to witness the most beautiful snowfall! 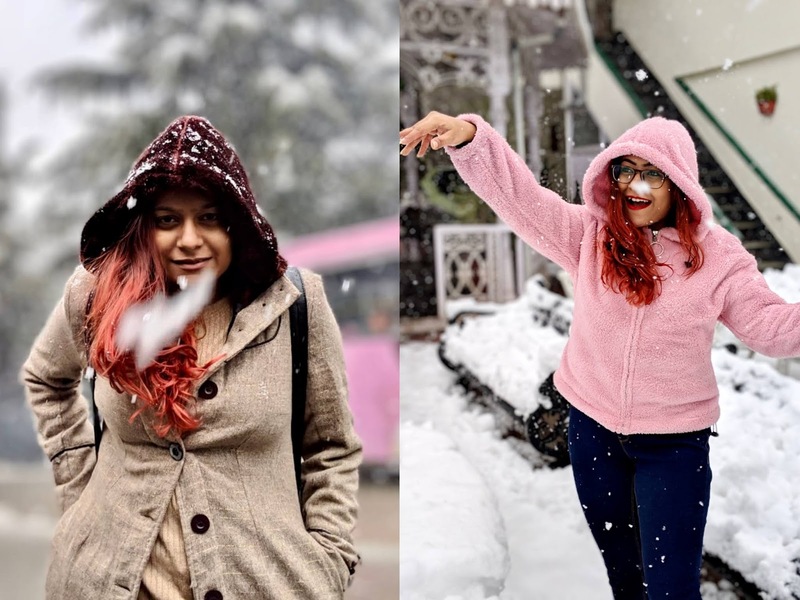 It was so fascinating, that we got off the bus and waited for almost an hour at the station, enjoying the snowfall, clicking pictures and getting cold, until we spotted a maggi point and hogged like mad in a hot plate of spicy maggi that made us feel a bit warm. You have to agree, mountain maggi is unbeatable!!!! After a fun filled morning breaky, my travel partners - Saumya (travel blogger from RoadToTaste) and Tushar (ace photographer from Delhi) stuffed me in a cab (cab driver charged us Rs.200) and we headed towards our hotel, which was only 50 mtrs from the bus station at Moti Tiba. 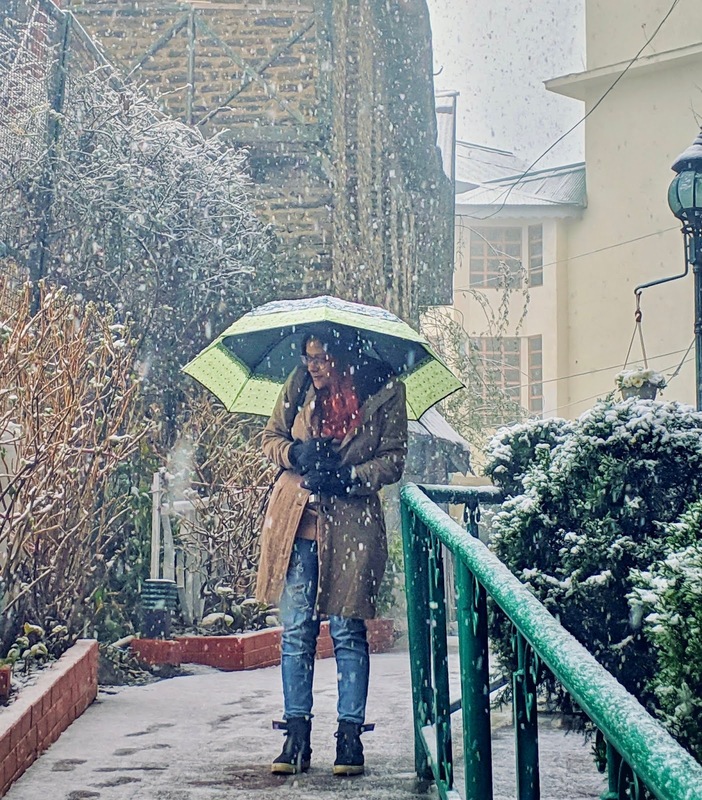 We also stopped at the market to fetch some umbrellas and gloves - because evidently we didn't realise while packing that it'd snow heavily at Dalhousie - the town named after The Earl of Dalhousie. We checked in at Grand View Hotel. A property that exists since the 19th century. 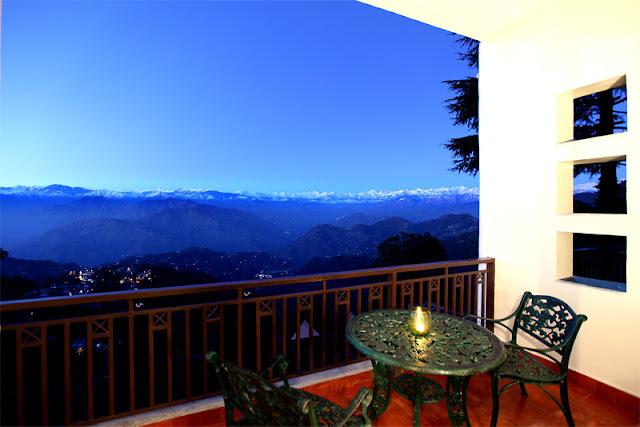 It is ideally located in the heart of Dalhousie, a 5 minute walk from the Mall and very close to the Tourist Bureau and The Dalhousie Club. It is beautifully maintained with a long faade of wood and glass leading onto a garden, terrace. 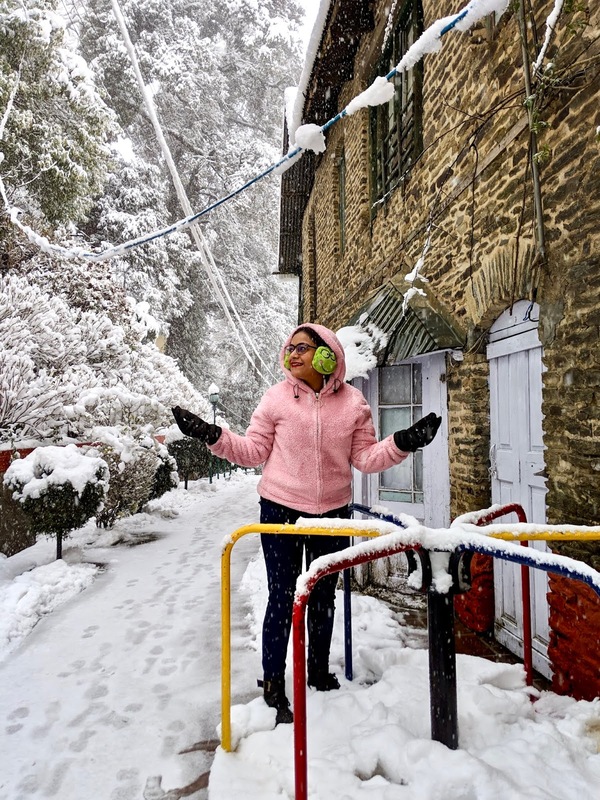 Nestling amidst the ranges of the Himalayas, the Colonial Architecture of the Imperial Block offers the perfect ambience to rejuvenate your soul! 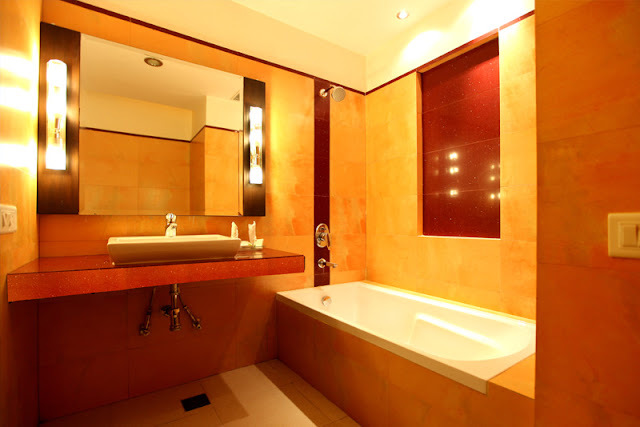 The facilities include : Spa, Coffee Shop, Restaurant, Conference Hall, Banquet, Lounge Bar, and a Recreational Activity Area. The Hotel offers Quality Service, Legendary Hospitality and attention at all times. The largest hotel in Dalhousie consisting of 53 rooms and suites, it is divided into three blocks Imperial, Luxury and Economy. We checked into our luxury room - we three opted to share one room which wasn't just an economical decision but the most fun one. A two day trip wouldn't be so much fun if we stayed separately! 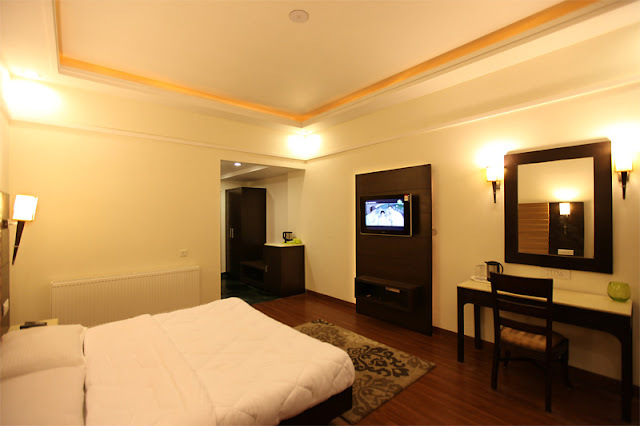 The room costed us Rs.5557 in total; was booked via goibibo. It was an insulated room so that made it cosier. 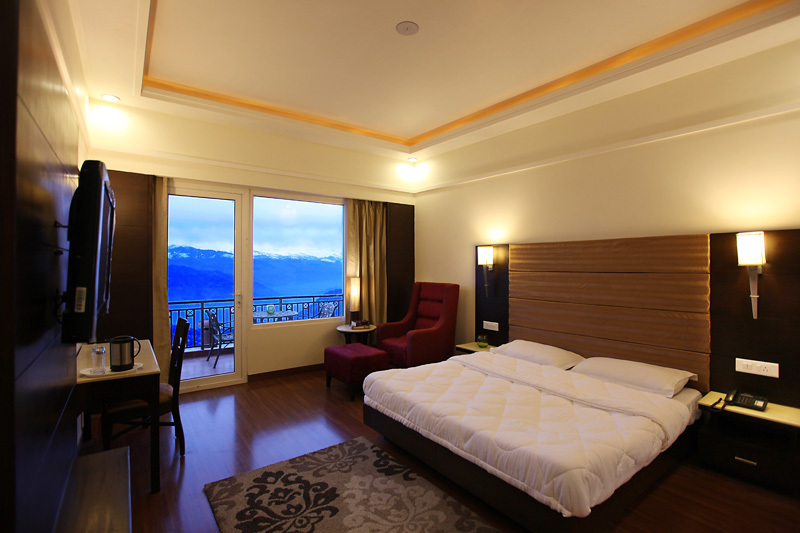 It was equipped with all amenities, and the best part was the balcony from where the Himalayan snow peaks seem within touching distance. We decided to chill in the room for a while, and take a nap! Post lunch, we got ready and went out for a walk, mostly to click photographs in snow. 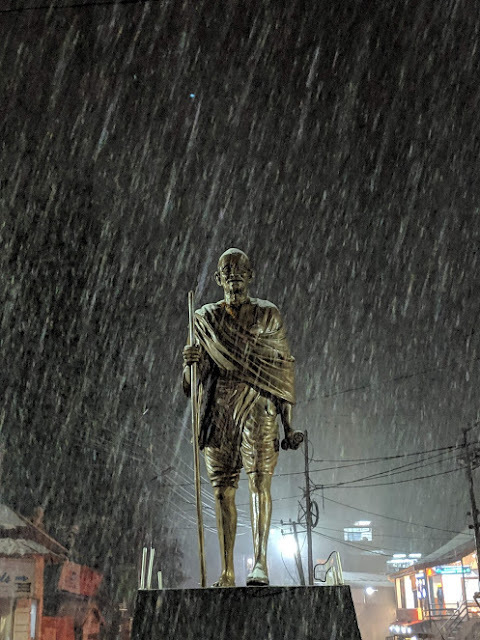 Later in the evening, we decided to visit Gandhi Chowk, which is about 2 kms from the hotel. We hired a cab and it took us 15 minutes to reach our destination. The roads were blocked because of traffic, so we had gotten off the cab mid way (costed us Rs.200) and walked till the chowk! 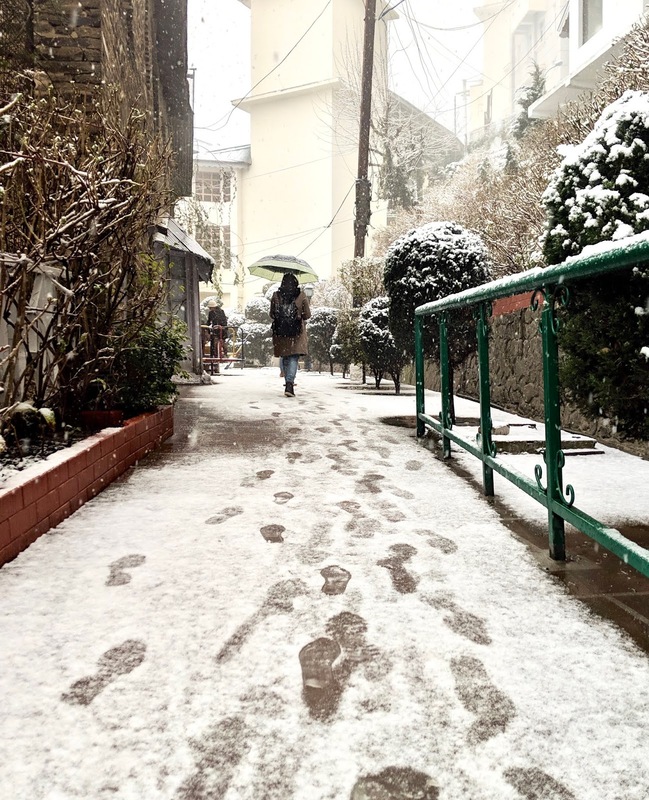 We were exploring the market and it started snowing again. So much so, that within minutes the entire area was packed with snow and we could hardly see any humans! We requested a cab driver to drop us at our hotel, and very sweetly he agreed and dropped us safe (cab from Gandhi Chowk to Grand View Hotel - costed Rs.300). Hill driving is such a task, I've seen it! We reached our hotel and went straight for dinner. Honestly, dining in the majestic British Style Multi- cuisine "Tiffins" restaurant at Grand View Hotel was an enriching experience. 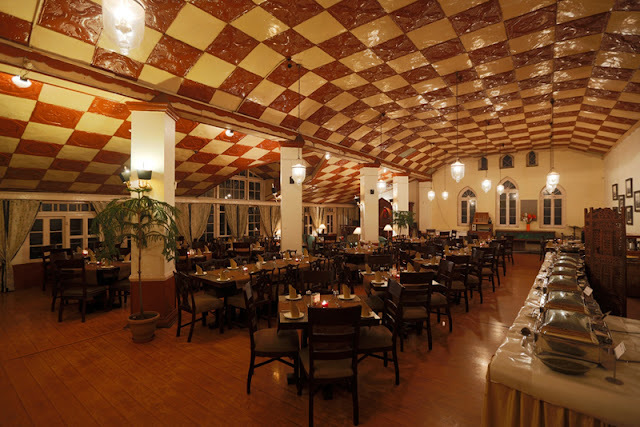 Tiffins, the in-house restaurant is the largest restaurant in Dalhousie! The next morning (Jan 6), we woke up to the snow covered peaks that we could see from inside our rooms via the window glass, and once we got off from the bed, we could see our balcony covered with snow too. The view was surreal! We quickly sipped our morning coffee, and decided to explore Khajiar & Chamba, but unfortunately we were informed that due to heavy snowfall and security reasons, all roads were blocked. So, we decided to stay put at our hotel but not miss the fun! We got ready, checked out of the hotel as we had to leave for Delhi in the evening. We left our bags at the cloak room to collect them later, while leaving. Now, our hotel had super alluring view, but in another case, we had some majestical sight to witness from the adjacent hotel - Hotel Mount View that had prettier locations to get photographed at. We literally left no spot untouched! I went back to my kid mood and played with snow like a happy baby. You won't agree more seeing my pictures, eh? These were the best moments of my life, with my favorite two. After staying there and enjoying ourselves till 3 PM, we decided to head back to the hotel, have lunch and leave for Banikhet - till where we had to trek because the roads were shut so our bus couldn't climb up! We had to catch it from 3 kms down from Dalhousie. We quickly got a porter to carry our luggage from the hotel (costed us Rs.300). I was so scared climbing down the hill, and can't thank enough Tushar for being my support throughout. Tip : always by shoes from Woodland, they keep you gripped on the mountain roads, and you'd be able to help others walk down too! 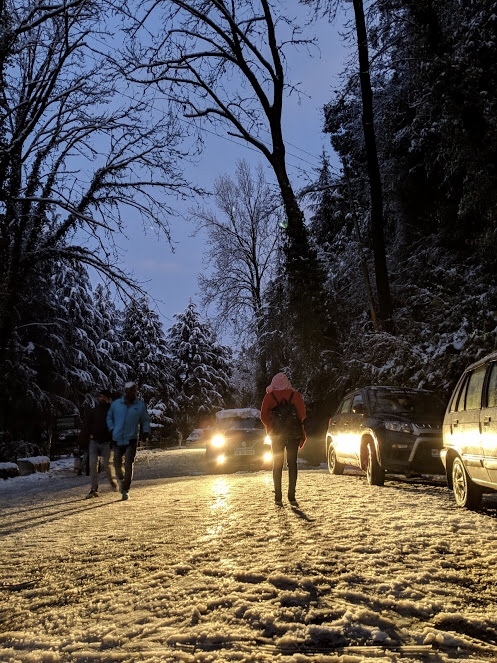 The roads were entirely covered with snow, and the cars were too. 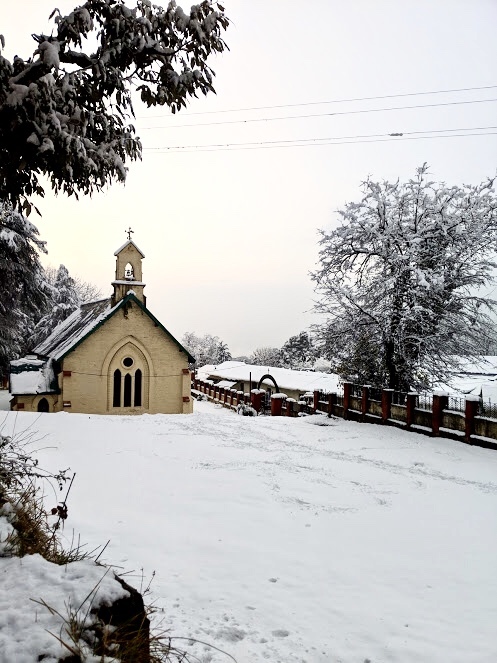 We also passed a little church that looked really pretty, covered in the white cotton like snow. After a walk of about 3 hours, we reached at the cab that dropped us a kilometre ahead till the bus stand (costed Rs.300). We had reached before time to the bus stand, so we decided on hogging onto some tea and pakodas at a local shop in the market. The tea wasn't that great but I loved the pakodas, and was almost on the verge of ordering another plate when my partners cried "the bus is here". It was 7:50 PM, and time to bid goodbye to the beautiful city of Dalhousie! We boarded the HRTC bus from Banikhet (tickets costed us : Rs.4792, booked on redBus). Again, an over night journey to Delhi. 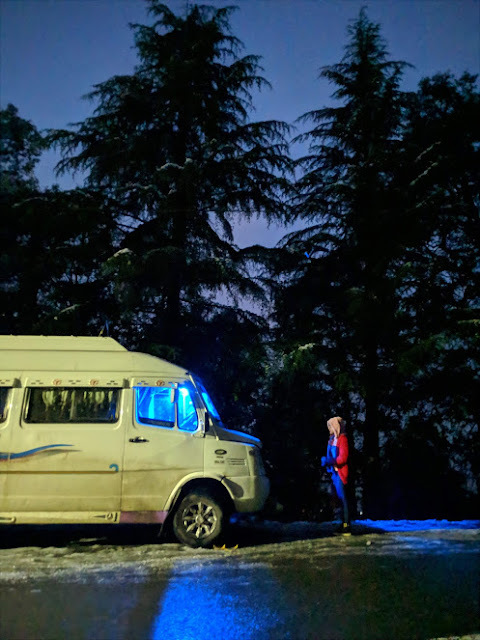 We reached back at 6 in the morning (Jan 7), dropped off at North Delhi. I hired a cab back home, slept for a bit and got ready for office. Back to my daily grinding! Looking forward to more such happy trips in future. Until then, tada!